Mars is red because of rust in the surface rocks. A volcano on Mars called Olympus Mons is the highest mountain in our Solar System. Mars has polar ice caps just like Earth. How big is the planet? Mars is 6,804.9 km or 0.533 Earths in diameter. That makes it a little more than half of Earth's diameter, so its volume is around 15% of the Earth's volume. -Fourth planet from the Sun Rather eccentric orbit. -Average distance from the Sun is 142 million miles Perihelion distance 128.6 million miles, aphelion distance 160 million miles. -Takes 687 days to orbit the Sun. -Distance from Earth varies from 36 million miles (nearest planet after Venus) to over 250 million miles. Panorama from the Mars Rover "Spirit"
The surface of Mars is dry and dusty. The highlands of the southern hemisphere have more craters than the lower areas in the northern hemisphere. One of the craters is the huge Hellas Planitia. It is 2100 km across. There is an area called the Tharsis Bulge that has four huge volcanoes. These volcanoes have not erupted for millions of years. 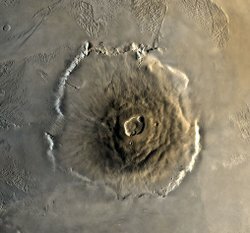 The largest one is Olympus Mons. It is 27 km tall, making it the highest mountain in the Solar System and much higher than Mount Everest on Earth. It is 540 km across, making it too big to see the whole thing from the surface of Mars. Mars has a huge canyon called Valles Marineris that is much bigger than the Grand Canyon on Earth. It is 4000 km long, up to 7 km deep and up to 200 km wide. It is thought that Valles Marineris was made when the surface cracked when the Tharsis Bulge formed. There are also two ice caps at the poles. They are made of carbon dioxide and water ices. The northern one is large and the southern one is small. In some places, there are channels that look like they were made by water erosion. Mars may have once been a wet planet like Earth. If you got in a spaceship and landed on the surface of Mars, you would notice that there is air and an atmosphere, but it is very thin. When you are standing at the bottom of Valles Marineris, there is almost the same air pressure as you would find on the top of the tallest mountain on Earth, Mount Everest. Even then, you would not want to breathe it because it has very little oxygen, and much more carbon dioxide than on the Earth. Carbon dioxide is the gas that you send out from your lungs when you are breathing. Even with these problems, someday people will travel to Mars and walk on its surface. What are its moons like? It is believed that these moons did not originally orbit Mars, but were instead a part of the Asteroid belt. When these pieces of the Solar System came close to Mars, they were captured by the gravity of Mars and went into relatively stable orbits around Mars. Like the Earth's moon, these moons are in a tidal lock, always keeping the same face towards Mars while they are in orbit. In Roman mythology both Phobos and Deimos were the sons of the Roman god Mars. Phobos means "fear" or "fright". Phobos also orbits closer to Mars than any other moon to any other major planet in the Solar System. In a few million years Phobos will eventually crash into the surface of Mars due to orbital decay, where it goes closer to the surface of Mars every year. Deimos means "panic" or "dread" as the son of Mars. 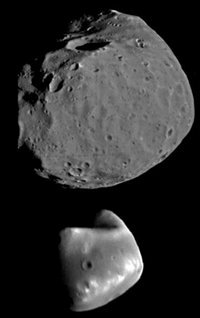 Deimos is one of the smallest moons of any planet in the Solar System currently known. How long is a day on this planet? One day on Mars is only a little longer than an Earth day at 1.025 Earth days. A year is 1 Earth year and 322 Earth days long. 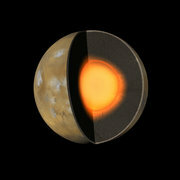 It is thought that Mars has an iron core with some sulfur and a mantle and crust made of silicate. How much would Mars's gravity pull on me? If you were on Mars, it would pull you down with a force about two fifths as strong as the force of Earth's gravity. You could lift objects that weigh almost three times as much compared to similar objects here on the Earth. You could jump up almost three times higher, and it would take much longer to fall to the ground from the same height. 3) An object weights 100 pounds on earth. What would be its weight on Mars? a) Mars has one natural Moon and one unnatural one. c) Mars is the fifth planet from the Sun. d) Mars is like the Moon and has no atmosphere.